Splash pages, you gotta love 'em. A blank canvas where the artist can hit you with a large dose of illustrated 'wow'. 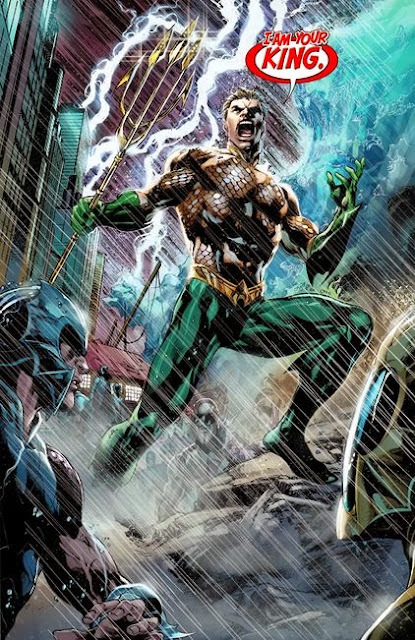 This week, celebrating the best of 2013, I can't miss highlighting the stunning splash-page filled job DC have done, in reestablishing Aquaman as a force in the DCU. The "stunning" splashies like this one, were often drawn by Ivan Reis. My top DC52 title, Aquaman has consistently punched above its weight, even after it's initial all-star creative team handed the reign over. Crossing over with Justice League for Atlantis's invasion of the surface (where this splashie hails from) helped cement Arthur's new authority as a character even further. Looking forward to seeing more in 2014! Aquaman has been one of the best from 2013. A real heavy hitting creative team made the King of Atlantis a must read. It sure was Tiger - even after they swapped folks behind the creative desk it just kept on going. Now that's a feat for any book to match - even Batman!